Harbourfront gets an A+ for getting its audiences up on their feet to dance. 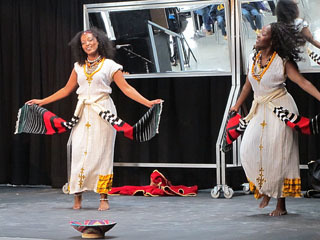 The teachers last weekend were from the Jaivah Nouvel Expose Dance Troupe, a group that specializes in traditional and contemporary dance from Ethiopia, Eritrea, Congo, Southern Africa, and Egypt. What better way to learn about a culture than to participate? They were very good. The program started with an amazing song by Waleed Abdulhamid from the Sudan, on the flute with vocal percussion. This vocal feat must be seen to be understood. 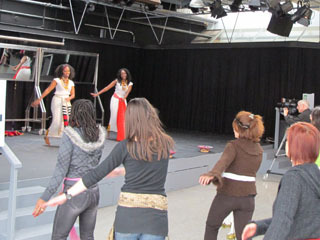 Then two women danced the Eskesta, a popular Ethiopian dance that celebrates just about every event. You can expect to see it at weddings and harvest time there. It originates from the Amhara people. Then came the dance lesson that went on for about an hour. About forty people got up to learn. Spectators dwindled away while 20 or so dance students persisted valiantly to the end. Teacher Saba cheerfully demonstrated each movement in turn. The neck, the rotating shoulders, the shimmying chest, and the thump of a foot. She was patient and clear. She was great. Saba was born in Ethiopia and grew up there, learning the dances through watching and imitation. After she arrived in North American, she took classes in African dance. She teaches workshops now but like many other dancers, she has a day job. She is a web designer and helps with the family beauty supply business. For more information, you can contact the group at: info@nouvelexpose.com, or telephone Saba at 647-833-0752. She is available to teach others or to perform. The web-site is: http://jaivah.com/site/.